December 6, 2000. Microraptor, a tiny feathered theropod from China. BBC News OnLine, with a strange-looking reconstruction. December 5, 2000. Water-laid sediments on Mars (but VERY ancient ones). With IMAGES. December 2, 2000. Tremendous bombardment of Moon (and Earth) at 3.9 billion years ago. Science News, reporting on a paper in Science. We knew about this, but the new evidence makes the story stronger. The bombardment woiuld have sterilized Earth even if life had already appeared. This means that life did arise quickly. Bombardment folks would like to think that the crisis somehow HELPED life to evolve, but remember that that is speculation and, quite possibly, wishful thinking. November 10, 2000. New early theropod from Italy, Saltriosaurus. Story from BBC News OnLine, and poorly written at that. Bad show, chaps. I'll look for a better account! November 10, 2000. Europeans still have gene distributions that reflect their Paleolithic roots. Story from BBC News OnLine. The paper was published in Science. October 16, 2000. Cromagnon people painted the earliest known lunar calendar on the walls of Lascaux cave. From BBC News OnLine. October 10, 2000. FIVE new Tyrannosaurus rex skeletons discovered in Montana. From BBC News OnLine. To put it in perspective, it took 120 years to find the first 15. October 11, 2000. DNA from a third Neanderthal. Story from BBC News OnLine. OK, so we have three rather than two. It doesn't alter the situation, that we can't tell anything about the relationship between Neanderthals and modern humans, IMHO. Stringer in particular should know better! See previous stories from March 29, 2000. September 8, 2000. New evidence on the Permo-Triassic extinction. Peter Ward and colleagues describe evidence for major erosion right at the P-T boundary in South Africa, at the same time as a major plant extinction. The evidence suggests that land plants were "clear-cut", leaving nothing to hold the soil in place. Nice paper! News item in Science, with link to the paper. Neanderthals were (sometimes) cannibals. From Science News. August 25, 2000. Important experiment produces organic chemicals in hot-vent conditions. Story from the New York Times. Be careful! This experiment shows that organic materials can be produced at hot vents. It does NOT mean that life originated there. Important chemicals can be produced on comets, in the atmosphere, at at shorelines as well. They can all be supplied to the ocean on the early Earth. It is an entirely separate question (though it can be asked and answered scientifically) where life began. August 1, 2000. Earth's oldest oil. Discovery of the oldest oil, showing that life was already abundant enough to form oil from breakdown products over 3.2 b.y. ago. News article from BBC News OnLine. Reference: Rasmussen, B., and R. Buick. 2000. Oily old ores: Evidence for hydrothermal petroleum generation in an Archean volcanogenic massive sulfide deposit. Geology 28: 731-734. July 28, 2000. Dinosaur farts eventually killed them all. Every now and then, you get an absolutely delicious dose of idiocy in our field, usually connected with dinosaur evolution or human evolution. Here is one. It's so bad that I leave it as an elementary exercise in scientific criticism for you to figure out why it's wrong. Story from BBC News OnLine. Now the BBC isn't stupid either: their editors know that this is rubbish. But it's also irresistible as a news item. July 7, 2000. Living bacteria in the ice of the South Pole. NSF press release, and the same press release at another site. July 4, 2000. Some Greek myths were based on fossils. From the New York Times, featuring research and a recent book by Adrienne Mayor. June 21-23, 2000. NASA announces the discovery of water-carved gullies on Mars, and they look fresh, therefore new. The media immediately jump on the "There-IS-water on Mars" aspect of the story. Story from the New York Times, June 23, 2000. Fascinating and very useful discussion about the physical chemistry of liquid water on the surface of Mars. From NASA news service, June 29, 2000. From BBC News OnLine. The reporter apparently talked only to proponents of the idea. Story from the New York Times, June 23, 2000. Has more balanced treatment of the arguments. Here's a little note from me. June 16, 2000. Discovery of sugar molecules in space. Story from BBC News OnLine. Obviously, this helps in prebiotic synthesis of more complex molecules, and adds to the potential importance of space-delivered molecules for life on planetary surfaces. June 14, 2000. Cromagnon weaving? Story from BBC News OnLine. Olga Soffer argues that evidence of woven textiles revises our view of Cromagnons and their contemporaries in Eastern Europe. And she's probably right: is this the cultural difference between these people and the Neanderthals? My wife says that weaving doesn't require looms, as this story suggests, but that's a minor point. Sue: The Largest and Most Complete T. rex. Sue's home page at Chicago's Field Museum. Review of Tyrannosaurus Sue, a book by Steve Fiffer published this week. Excerpts from the book, from the amazon.com Web site. Looks to me like a "don't-read-this" book! Maudlin piece by Fiffer on the unveiling. Sue had an eventful history during its life, and after its discovery too!. Article from Science News, 1997. May 12, 2000. Very early Homo discovered in Georgia. From the New York Times, based on research published in Science. News item from Science news writers. There's no question what this fossil is: the question is what to call it. It is what some people call Homo ergaster, the best-known specimen of which is the Nariokotome Boy from East Africa. Other people would call it an early Homo erectus. Either way, this Homo has so far only been found in East Africa. So now here it is in the Caucasus region, at Dmanisi in present-day Georgia. And the date is fairly well defined at around 1.7 Ma, in other words, EARLY. The 2000 tools at the site are Oldowan, not Acheulean, another indication that this is early. The Georgian fossils are intriguing because they are in the right place and at the right time to be candidates for the ancestry of Homo erectus in Asia, which also was pre-Acheulean in technology. This is a major find, requiring important modification of our ideas for the migration and evolution among early Homo. See reference list update for Chapter 22. We may not have large stature, we may not have big brains. While we were marching to Georgia! Hurrah! Hurrah! Kenya's far behind! Hurrah! Hurrah! Georgia's on my mind! May 7, 2000. Comments on Disney's new movie Dinosaur. The movie. Story from Newsweek. Perspective on the science. Story from Newsweek. May 5, 2000. DNA collected from Tasmanian tiger. According to the story, Australian scientists feel they have some chance of cloning the extinct carnivore. Story from the Sydney Morning Herald. May 5, 2000. The largest carnivorous dinosaur, from Argentina.This was announced in March, but I've brought it back to here because Scientific American has published a short feature about it It is probably a new genus, but related to Giganotosaurus, also from Argentina. 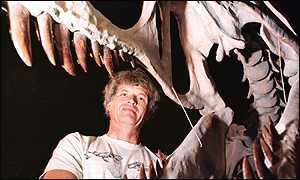 Here is a picture of the skull (with Phil Currie, for scale and authenticity!). May 4, 2000. Early humans on an African beach in the last interglacial. Tools found on the Eritrean coast (of the Red Sea) date to 125,000 BP or so, suggesting that early Homo sapiens may have been migrating along shorelines at the time. Story by Henry Gee from Nature's science news site. May 4, 2000. Livonia multidentata, near the fish/amphibian transition. This is the best story I have found on the new fish/amphibian fossil from Estonia, though there is still very little real information. AP story from Independence Avenue. May 2, 2000. Use of ground rock as pigments for art work, in Africa well before modern humans. Story from Independence Avenue. The date is over 350,000 years ago. Many anthropologists have cited "art" as a modern human characteristic. However, this new rock art cannot be by "modern humans": it's too old. Either the older story is right, and "archaic" Homo sapiens was evolving "art" early, or we have to recognize that Homo heidelbergensis (call it what you like) was capable of art work in Africa as well as the design and manufacture of exquisite spears in Germany. This is more evidence, in my opinion, that something is radically wrong with the current emphasis on recent origin for Homo sapiens. April 26, 2000. Discovery of new Australopithecus robustus skull in South Africa. AP story from the New York Times. April 10, 2000. Arguments over collecting fossils on Federal land. From the San Francisco Chronicle.. Comment on the Nature news service. Commentary in Nature, March 30, 2000. Note: unlike most pieces in Nature, this one is freely accessible on the Web. The full text of the Nature paper, March 30, 2000. Note: unlike most pieces in Nature, this one is freely accessible on the Web. Article in the New York Times, March 29, 2000. March 28, 2000. A single mutation led to language?!?!! A crackpot idea published on the BBC News OnLine site. This is said to have occurred on the (male) Y chromosome. Why am I not surprised? There is apparently no evidence at all to back up the idea. The author says that it can be tested genetically. Why (in Heaven's name) did he not test it before opening his mouth? This is the sort of thing that gets science a bad name. Well, to be fair, he's not a scientist, he's a psychologist. And he's from Oxford. Now that I have alienated many of you, why don't you read the story and see if you like it any more than I did? March 27, 2000. The moas of New Zealand went out in a tremendously rapid Polynesian Blitzkrieg. Newsbrief from the Discovery site, March 27, 2000. From the New York Times, March 28, 2000. March 23, 2000. Knuckle-walking in our ancestors? This piece of research says that there are features of the wrist of early Australopithecus that are the traces of "knuckle-walking" in their (and our) ancestors. No real surprise: knuckle-walking is the way that today's chimps and gorillas get around on the ground in a quadrupedal mode, with the fingers curled under into a fist, and stress passed upward into the lower arm. Australopithecus was already walking upright, of course. Frankly, I don't see the big deal here. A little point that worries me is that the authors allegedly claim that knuckle-walking is a feature of African apes only. Well, I've seen orangs knuckle-walking, and have photos to prove it. Knuckle-walking may be deep within anthropoid lineages, which spoils this part of their story, but doesn't affect their demonstration that our ancestors were knuckle-walkers. In fact, it strengthens it: more of our ancestors may have been knuckle-walkers than they might like. From Nature news service, March 2000. Henry Gee makes an unusual lapse in logic, trying to make this paper sound important. Read his story, and then ask whether chimps climb trees or not. March 18, 2000. Apatosaurus cracked its tail like a whip (supersonically). Story from Science News. This is not a new suggestion, but since it comes from multimillionaire Nathan Myrhvold of Microsoft (or is it multibillionaire? I lose track after a certain amount), it tends to get a lot of attention. And it's a vivid idea, no matter where it came from. Short report from Reuters on ABC News OnLine. Press release from Northern Illinois University, with a "primate press kit" added! You can find the same press release at the Science Daily site. March 13, 2000. Look out for....Ultraviolet Spring!!! A new asteroid disaster scenario, from Oregon State University. Press release, also posted at this site. March 9, 2000. How do you keep mammoth meat fresh? Dump it in the lake. News item on the work of Dan Fisher, from the University of Michigan. From the Discovering Archaeology site. March 4, 2000. Is this the oldest built shelter? (About 500,000 years ago, in Japan.) Story from New Scientist..
March 3, 2000. Beautiful stone axes found in China. These are well dated at 800,000 years, suggesting that they were made by Homo erectus. The research is reported in Science. March 3, 2000. More new research casts doubt on the life-in-Martian-meteorite claims. Evidence from sulfur isotopes was originally cited as favoring the idea of life in Martian meteorites. However, new evidence shows that the sulfur was deposited inorganically Press release; you can find the same press release here. Things look bad for cloning the mammoth. From the New York Times, October 29, 1999. News of the successful excavation of the mammoth. A very excited piece from the Washington Post. Regularly updated news from the expedition, from the Discovery Channel, which is financing it..
See also a feature from the New York Times on the cloning aspects of the project. January 31, 2000. Martian meteorites found in Mojave Desert. Story from BBC News OnLine. Don't hold your breath for great scientific information from these two . It sounds as if the dominant chemical in these meteorite will be rat urine. January 19, 2000. The latest largest dinosaur, estimated at 51 meters (175 feet) long. Here is the latest largest dinosaur, in a news report from BBC News OnLine. This new unnamed dinosaur is from Argentina, and is estimated to have been 51 meters long (175 feet). Warning: the estimate is based on multiplying up from the size of two neck vertebrae. January 13, 2000. A very early bony fish from Australia. From the Nature news update site. A very early bony fish has characters of rayfins, lobe-fins, and sharks. One might expect characters of these first two, but it's not clear why "shark" characters are there. Coincidence, or are sharks closer to bony fishes than we had thought? January 11, 2000. The Michigan view of human evolution. This press release, also available here, talks elliptically about a new paper in the journal Molecular Biology and Evolution by a research group from the University of Michigan. As I read the press release (and before I read the paper itself), this looks like an extreme view of human evolution, in which there is only one human species, evolved in Africa about two million years ago. Probably this would include H. habilis and all descendants, encompassing as subspecies all the "species" defined by other investigators. The question really is whether this is biologically real (it may be). Certainly the extensive evolution within humans in the last 2 million years still requires explanation, and certainly the various human groups will need to retain at least some descriptive names. First, I need to read the paper and make an informed decision whether to accept this view or not. Second, look out for fireworks as others discuss the paper. January 6, 2000. More support for the RNA world. From Nature news service, January 2000. January 2000. Very old Homo erectus tools in China? New discoveries have resulted in the claim that there are tools, made by Homo erectus, in China as early as 2.25 Ma. It's not clear that they are that old, but they could easily be 2 Ma. Either way, it looks clearer and clearer that Homo erectus evolved early and migrated early to Southern Asia. Newsbrief from Archaeology, January 2000. Return to Current "Paleontology in the News".